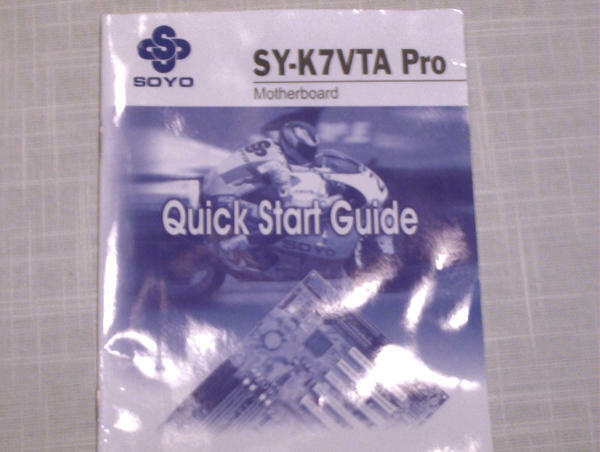 Before actually installing the motherboard, be sure to thoroughly read the motherboard manual. Usually it will be a paper manual, but sometimes it may be on a CD or DVD. You want to familiarize yourself with the board's layout and connections, make absolutely sure that it is compatible with the processor and RAM that you will be using, make sure that the jumper settings (if any) are correct, and check for any other warnings or instructions. In most cases, you won't actually have to do anything to the motherboard. Most modern motherboards have a "jumper-free" option that can be selected (usually by setting a jumper, amusingly enough) that will allow you to control the motherboard settings from the keyboard during CMOS setup. When setting a jumper is required to enable the jumper-free settings, that jumper is usually pre-set that way from the factory. But check anyway just to make sure. It's a lot easier to check the jumper (and move it, if necessary) before the motherboard has been installed in the case. About the only difficult part of installing a motherboard is matching up the mounting holes in the mobo with the ones on the case. In theory, the mounting hole locations are standardized within a given form factor; but in practice, it's a rare thing to find a case and motherboard whose mounting holes exactly correspond. More often, you will have to look at the mounting holes in the motherboard to determine which mounting holes on the case you will be using. Some motherboards come with a paper template that makes this easier. If your motherboard doesn't come with a template, one easy way to determine which holes to use is to lay the motherboard in the case, temporarily fasten it with two screws on opposite corners of the motherboard, and use a Sharpie through the remaining holes to mark the rest of the mounting points you'll be using on the motherboard. It's good practice to use all of the motherboard's mounting holes, but you probably won't use all of the case's mounting holes. Chances are that the case will have "extra" holes to accommodate different boards. Just ignore those holes. 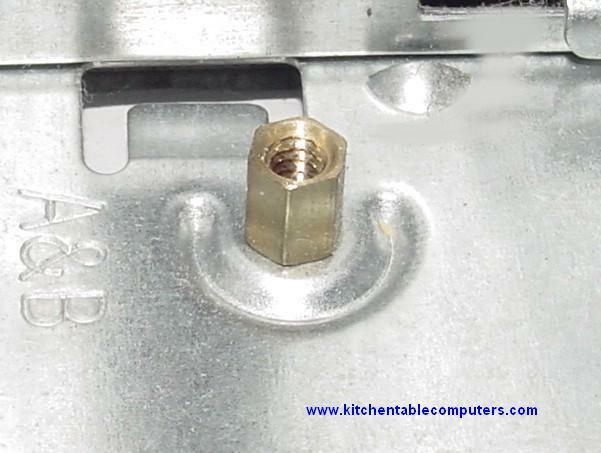 Once you have determined which mounting holes you will be using, you will need to insert standoffs in the corresponding holes in the computer case. Chances are that some of them will already be installed, and you will have to install the rest. There are several types of standoffs, with the ones in this picture being the most common. 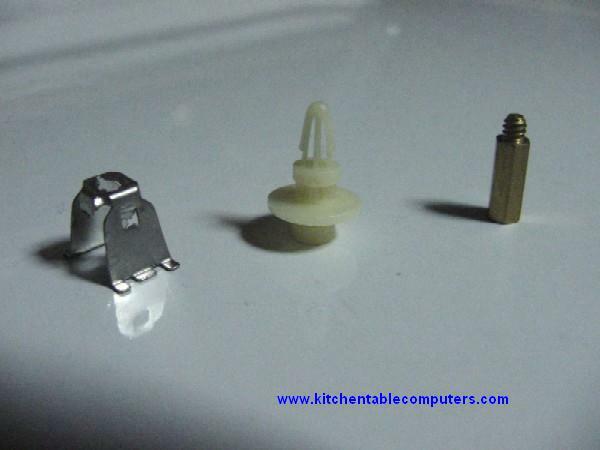 The purpose of standoffs is to separate the back of the motherboard from the metal case. You will first install the standoffs in the mounting holes in the case that correspond to the holes in your motherboard, and then you will attach the motherboard to the standoffs. That provides a gap between the motherboard to prevent shorts. Sometimes the standoffs also ground the motherboard to the case through some of the mounting points, but the power supply cable will also provide a ground if the motherboard uses plastic standoffs. If you don't install the standoffs, then you almost certainly will fry your motherboard when you try to install it. You also can damage your motherboard if you mount a standoff in a hole that doesn't have a corresponding hole in the motherboard. So be careful. Use all the holes in the case that are also present in your motherboard, and no others. 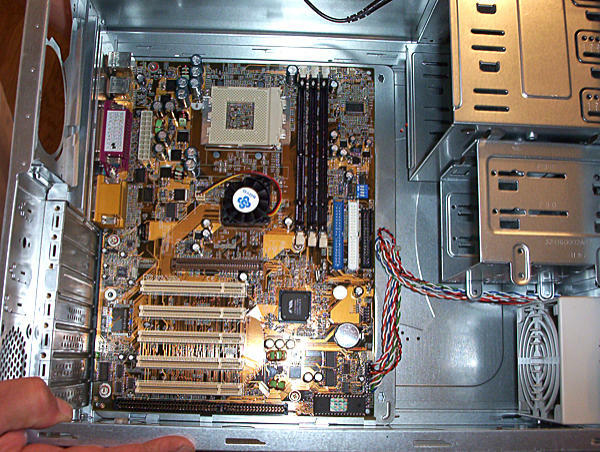 The standoffs are screwed or inserted into the chassis, and the mobo in turn is attached to the standoffs through the mounting holes in the motherboard. This creates a small space that prevents the back of the motherboard from shorting out against the metal case. Standoffs must NEVER be inserted into any of the "extra" holes, however. As mentioned earlier, standoffs installed in holes on the case that don't have corresponding holes in the motherboard can cause the motherboard to short out. Don't over-tighten the standoffs. Hand-tight plus a smidgen is enough. Most cases are made of thin metal that can strip if you over-tighten the standoffs. Also, don't bend the motherboard. If it doesn't fit flat, then something isn't right. Figure out what's interfering with the motherboard fitting flat against the standoffs. Don't try to bend it to fit. Once you have the correct standoffs inserted, lay the motherboard into the case, line up the mounting holes and the rear-panel connectors, and screw it down. 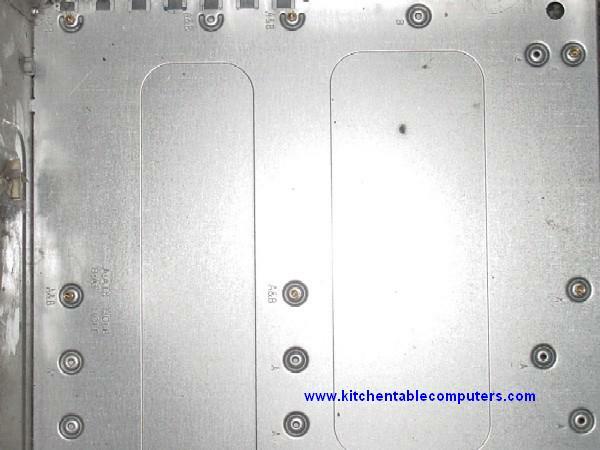 Usually, the easiest way to install a motherboard is to lay the motherboard over the standoffs slightly forward of the rear panel connectors, then slide it back into the rear panel connectors until the mounting holes line up. Make sure that you're not snagging any wires, then screw the board down. Don't over tighten-the screws! You will crack the motherboard if you do, and then it will be useless! The screws should be snug, not excessively tight. On the subject of tightening the screws, over the years, a few people who visited this site have told me that they watched a professional computer technician use an electric screwdriver to install a motherboard. I'm sure that's true. I also used electric screwdrivers when I was a computer technician, and I never broke a motherboard. But that's the kind of skill that comes with experience. While you're still learning, use a standard screwdriver, not an electric one. This is delicate stuff we're doing here: and once you break a motherboard, it's useless. Finally, connect the ATX power connector from the power supply to the motherboard. This picture was taken years ago. 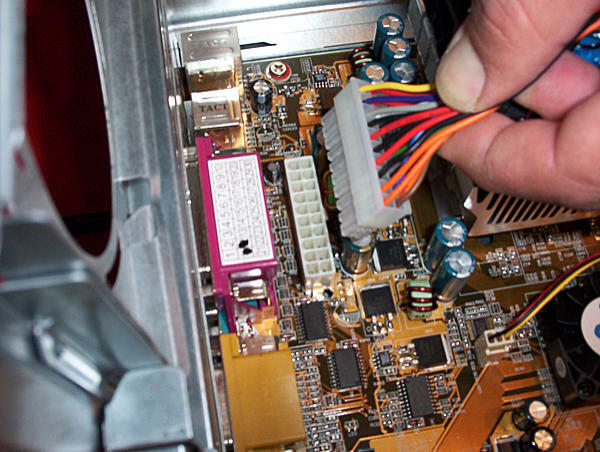 More modern power supplies and motherboards have more conductors in the connector, but they otherwise look the same. There may also be an additional four-conductor "P4" connector in addition to the main connector. Not all motherboards use them, but most power supplies have them. That's not a problem. Later on, you'll just tie off the unused power leads so they don't short anything out or get in the way of the fans. Attach the power cables now. If you forget about them and later fire up your computer while the ATX connector is not connected to anything, then you will fry your computer's power supply. Computer power supplies need a load attached to the main power connector or else they will burn out when you plug them in. You may also have to connect power to some high-end video cards and certain other components later on in the assembly process. If you're not sure where the connections are, read your motherboard's manual. At this point, take a look at the motherboard and case and once again review your assembly sequence plan to see what should be installed next. In our case, the next step was Installing the Processor.